Get a fabulous view of downtown Tampa as you fly in a helicopter just above the city’s skyscrapers. Start by soaring over Davis Island to catch a view of the island’s elaborate homes. Then make your way downtown, where you’ll see the St Petersburg Times Forum, the Florida Aquarium, the University of Tampa and more. Before your adventure ends, head to the Port of Tampa and Hillsborough Bay, where your pilot will lower the helicopter so you can see the bottlenose dolphins playing in the water. 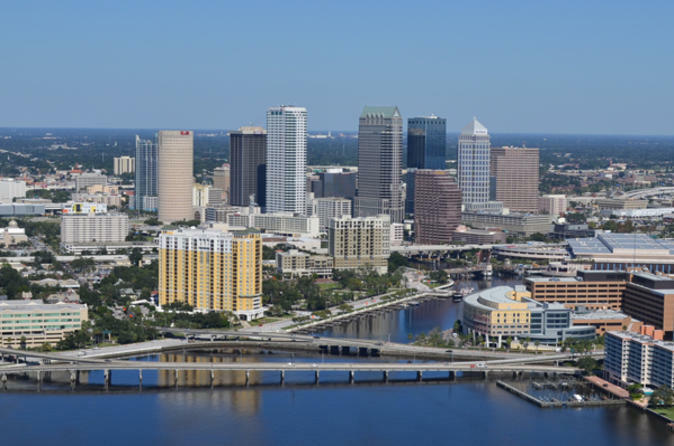 Take in the city of Tampa from the sky on this helicopter tour of downtown and its surrounds. From the Peter O. Knight Airport, your pilot will take off and head west to give you a glimpse of the mansions on Davis Island. Next, make your way to downtown Tampa. Your adventure takes you just above roof level of the city’s skyscrapers and provides wonderful aerial views of the St Petersburg Times Forum, the Florida Aquarium and the University of Tampa. Before you land back at the airport, pass over the Port of Tampa and Hillsborough Bay, where you can see bottlenose dolphins playing in the water.